It is common knowledge that drinking water is generally good for our health. Water is a great source of life and it is a necessary element for every cell and function in our body. Here we however would highlight the therapeutic benefits of drinking water on an empty stomach. Drinking water early in the morning immediately upon waking up can have amazing effects for a range of health conditions.This remarkable therapy known as Usha Paana Chikitsa (early morning water treatment) owes its origin from ancient Ayurveda. Also since decades, it is common practice among the Japanese to drink water immediately upon waking up on an empty stomach.The Japanese Water Therapy, like the water therapy in Ayurveda, has been prevalent since quite some time. Our bodies constitute 60-70% of water. Therefore, as the amount of water reduces, we face numerous health problems. 70% of the human body content is water, and therefore water plays a vital role in the functioning of the body. 75% of muscles are water. Bones also contain about 25% water. Why Should We Believe The Japanese? Japanese water therapy when incorporated into your routine contributes to a general state of well-being and health and has no known side effects. Actively promoted by Japanese Medical Society, it is no coincidence that Japan has proportionately the highest number of centenarians in the world. Can Water Wash Away Disease? Drinking water, the first thing in the morning on an empty stomach, purifies the body’s internal system. It particularly cleanses the colon, improving the body’s ability to absorb nutrients from food. This is achieved through a process called hematopoiesis involving production of new blood. This fresh blood has an immense restorative effect in the body and can even cure existing ailments. Water therapy is an excellent remedy for keeping the body hydrated and therefore control numerous diseases. Note: If you have a kidney problem or severe health issues, ask your doctor before starting the Japanese Water Therapy. Here are the steps you need to follow to carry out this therapy. After you wake up drink 4 x 160ml (22 ounces) glasses of water (not cold) before you do anything else, including brushing your teeth. After you finish your water, you can brush your teeth, but don’t eat or drink for 45 minutes. After every meal or snack, don’t eat or drink anything for 2 hours. If you are sick, elderly, or not used to this, you can start this process gradually that eventually equals 22 ounces per day. Avoid taking alcoholic beverages the previous night. It must be noted that the better the quality of water you consume, the better the results you’ll experience from this unique therapy. 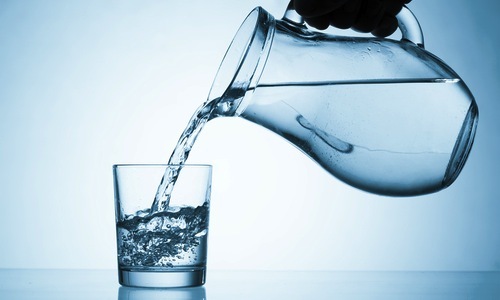 Drink water thrice a day if you are suffering from Arthritis or Rheumatism.You should drink 640 ml of water each time. You should continue this routine for one week. After one week you can drink the same quantity twice a day till the disease is cured. This treatment method has no side effects, though you may have to urinate more in the beginning of the treatment. Helps detoxify your body through sweat and urine. Helps you get glowing and healthy skin. Helps maintain body temperature. Helps expelling waste products from the body. Drinking water on an empty stomach purifies the colon making it easier to absorb nutrients. Increases the production of new blood and muscle cells. Helps with weight loss. Drinking at least 16 ounces of water can boost your metabolism by 24% in the morning. Balances your lymph system: These glands help you perform your daily functions, balance your body fluids and fight infection. Water therapy helps to control many ailments such as anemia, rheumatism, general paralysis, obesity, arthritis, sinusitis, tachycardia, giddiness, cough, leukemia, bronchitis, meningitis, hyperacidity, dysentery, gastroenteritis, uterus cancer, rectal piodapse, eye-disease, ophthalmic hemorrhage, irregular menstruation, laryngitis, headache and many other diseases. Dr. Fereydoon Batmanghelidj chanced upon the healing powers of water and the link between dehydration and chronic illness 17 years ago. At that time, he was serving a jail sentence as a political prisoner in Iran. During this period, Dr.Batmanghelidj used the only medicine available to him— water—to successfully treat 3,000 fellow prisoners suffering from stress-induced peptic ulcers. Upon release, Dr. Batmanghelidj—who trained in medicine at St. Mary’s Hospital Medical School of London investigated the negative consequences of dehydration. His discoveries enabled him to help numerous individuals suffering from unidentified dehydration-related diseases. He also authored two books comprising of his research findings, titled Your Body’s Many Cries for Water, and How to Deal with Back Pain and Rheumatoid Joint Pain. Most of his works have been peer and media reviewed and acclaimed both nationally and internationally. According to Dr.Batmanghelidj, the body’s biological thirst signals can be mistaken for signs and symptoms of other illnesses. If we attend the root cause —dehydration—we can prevent avoidable medical interventions and enjoy long-term well-being. He writes that humans not recognizing their need for water gradually become increasingly and chronically dehydrated with the progress of the age. Further confusion results when the body produces complicated secondary symptoms of dehydration. Many doctors misinterpret those secondary symptoms as unrelated diseases. Dyspepsia, Rheumatoid arthritis, Angina, Migraine and headaches, Colitis, Constipation, Hypertension, Anemia, Obesity, Sinusitis, Pulmonary tuberculosis, Asthma, Kidney stones, Diabetes, Irregular menstruation, Leukemia, Uterine cancer, Breast cancer. It must however be noted that when water intake is not controlled while undergoing water therapy it may cause danger. This is because our body has a limited capacity of throwing the excessive water. If this limit is crossed (drinking water in excess of (3+ liters) in a short duration ), body can face a critical condition known as water poisoning or hyper hydration. This can expose a human body to the risk of brain damage or heart failure. Also if your kidneys cannot keep up with excess water intake, the extra water will dilute the concentration of sodium resulting in Hyponatremia. As this happens, cells begin to stretch and things become potentially deadly. Though cells can expand with relative ease, the neurons in the brain cannot. Brain cells work in an extremely confined space and have little room for swelling. If this happens from drinking too much water, it could result in a coma, seizure or even death. ← What can B12 deficiency do to your health?